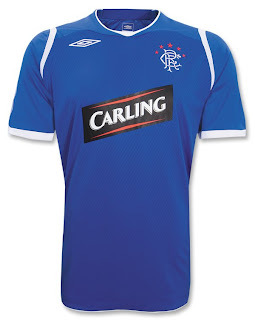 Scotland's Rangers FC, the other half of the Old Firm, recently released their new home kit for the 2008/2009 season made by Umbro. The new shirt is traditional royal or Rangers Blue with an embroidered Rangers 5 star scroll crest on the heart, an Umbro logo on the right, and is anatomically cut to emphasize the athleticism of the modern soccer player. It also features a hybrid neckline with no exposed seems for added comfort and a twill mesh body fabric which makes it lightweight and breathable. On the back of the shirt there’s a trilogy back panel - a new version of Umbro's lead fabric technology specifically developed to include a zonal body map mesh design - and also features a Saltire on the back neck. Also available are authentic SPL letters and numbers, so you’ll be ready to step in for the team any time.